Cutie & Patootie: Coney Island Kittens Up for Adoption! 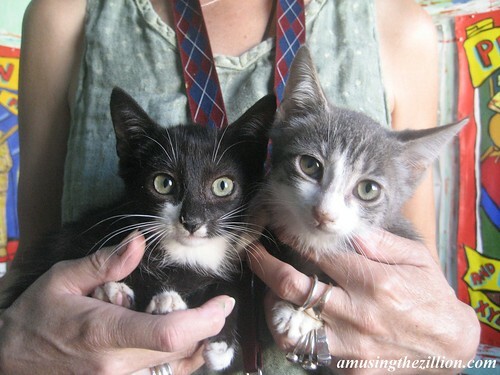 ATZ is happy to report that Cutie and Patootie were recently adopted into a cat-loving home. Their new names are Joan Crawford and Bette Davis! If you are looking for two cute (also too cute!) Brooklyn cats to adopt, please consider Spot and Dot. These sister cats are being fostered by our Coney Island Polar Bear friend Eric Weiss. These sister kittens from Coney Island were fostered for the past month but are now back with Marie Roberts and need a permanent home. “Cutie & Patootie aren’t shy anymore and purr constantly. They like to be with each other, monkey see monkey do,” says Marie. If you’re interested, contact Marie at bitterwonder[AT]hotmail.com or leave a comment below. September 6, 2010…ATZ recently got a chance to cuddle the teensiest kitten in Coney Island. 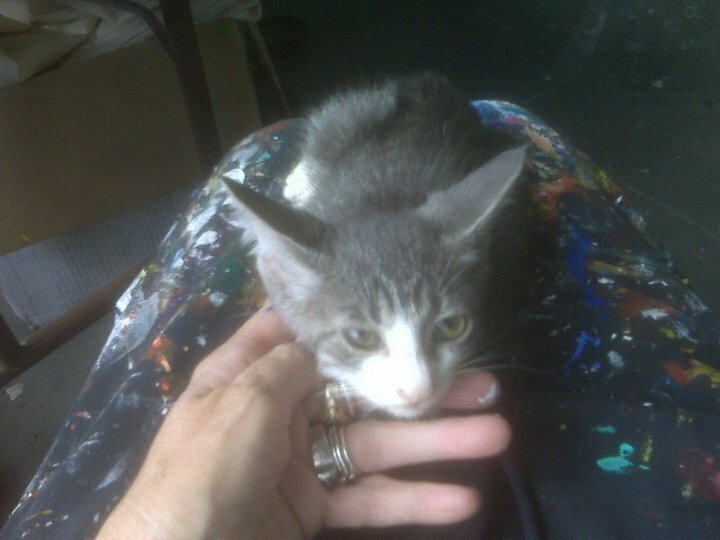 Marie Roberts, who paints the banners for the Coney Island Sideshow, took him in after he’d been abandoned by mama cat. The kitty was affectionate, alert, and lucky as all get out. After spending a couple of nights in her studio at CIUSA, he was adopted and is living in the lap of luxury! Since then Marie was able to rescue his siblings. Now that Cutie and Patootie have been checked out by the vet, these two little girls need a home. Marie writes: “Female kitten, Tuxedo. Shy but coming around. Very smart. Needs home/foster situation by Tues am. Below: Female kitten, grey tabby. A little shy. These are siblings. Vet washed, wormed and they are on antibiotics.” You can meet them today at the Coney Island Museum, 1208 Surf Avenue, 2nd floor. If you’re interested, contact Marie at bitterwonder[AT]hotmail.com or leave a comment below. Marie Roberts, who rescued the kits, writes: “Cutie and Patootie are in foster care until Fri morning (Sept 10) but they are still looking for a home with that special human.” She also noted that Cutie is spokes kitten for Patootie! These two really should be adopted together.